This one's a keeper. Yes, it is labor intensive. Hey, you might even build up your triceps with all that lemon twisting action - but, if you have the time, the effort is well worth it. This recipe IS quite sweet, so if your tastes preference runs closer to tart, go easy on the sugar. 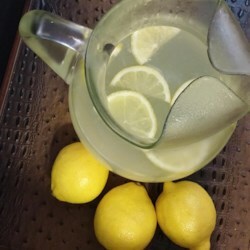 I needed six or seven lemons to make 1 1/2 cups of lemon juice.